The Reichert Model 30™ Pneumatonometer is an easy to use instrument that provides fast and accurate tonometry and optional tonography functions. The probe tip, which floats on an air bearing, is gently touched to the anesthetized cornea and a precisely regulated flow of filtered air applies force to the tip. A small (5 mm diameter) fenestrated membrane permits the air to flow through vents in the tip until it conforms to the shape of the cornea. Increasing pressure is continually applied to the cornea until the force being applied is equal to the pressure in the anterior chamber. When these forces are in balance a pneumatic sensor records the intraocular pressure. In pulse tonometry mode, the ocular pulse waveform is charted and recorded along with IOP. Doctors and technicians agree that the Model 30 Pneumatonometer is easy to use. The all-new touch screen interface features an easy-to-use icon-based operating system enabling even inexperienced users to make measurements in seconds. The full color display guides the operator through the measurement process and displays readings. The optional footswitch (available with the tonography kit - catalog number 16033) makes obtaining measurements even easier, freeing the operator to concentrate on handling the sensor probe. The integrated chart strip printout can be placed in patient files as a record of the diagnostic procedure. 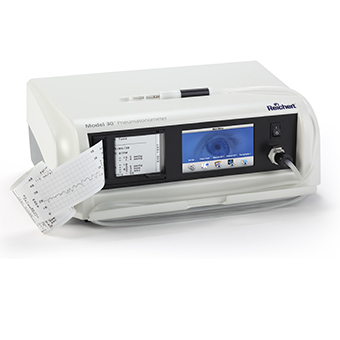 The Model 30 Pneumatonometer provides ocular pulse amplitude measurements in addition to tonometry measurements. The optional tonography mode enables measurement of the aqueous outflow efficiency of the trabecular meshwork.